Our mid & long travel suspension systems will your vehicle to the next level. With twice the amount of travel compared to stock you will notice an extreme improvement in off-road handling. Most kits are capable of 14” of travel and extend the track width three inches wider per side. 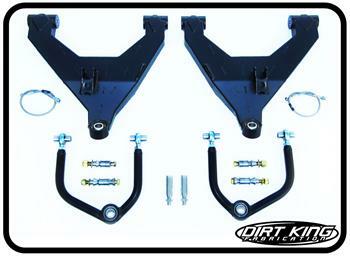 The lower control arms are tabbed and plated allowing limit straps and bump stops to be used. Our chromoly upper control arms replace the ball joints with stainless steel uniballs for more articulation. Also included in the kit are DOT approved brake lines. Our systems are built to the highest standards and only the best materials are used to ensure reliable performance. Unlike most companies we take the time to assemble our kits along with presetting our upper control arms saving you time and money upon installation.